I recently received this limited edition pack of Real Techniques brushes. Along with almost everyone it would seem, I am a big fan of Real Techniques brushes as a great budget friendly alternative that hold up against much more expensive brushes. 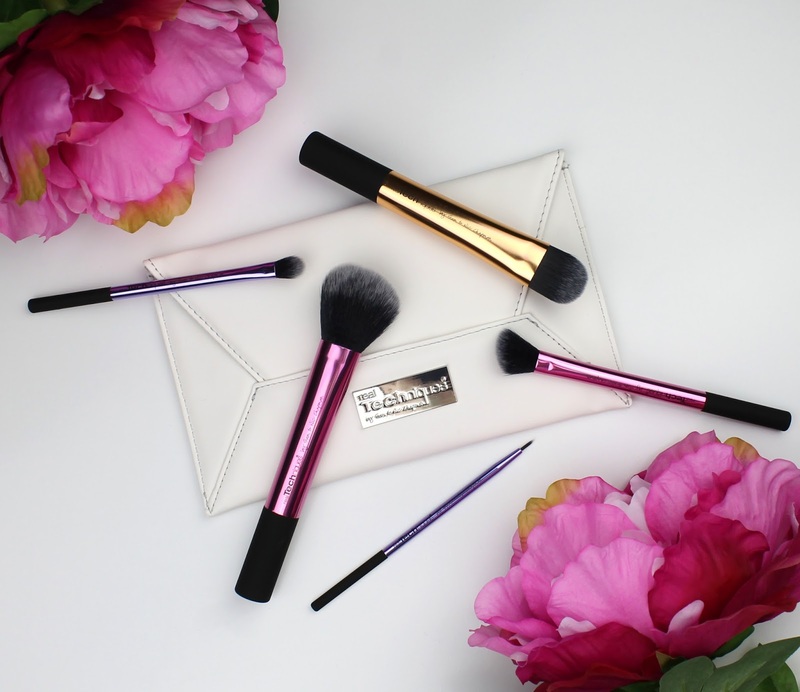 This is the Deluxe Gift Set that retails for $79.99 and comes with three exclusive brushes, two from the core collection and a white clutch purse. I will say that it is a little bit expensive for Real Techniques considering this really similar 5 brush set runs for $69.00. I'm honestly not the biggest fan of the clutch which just looks like a cheap afterthought so I think they would have been better off keeping the price lower and leaving it out. That being said though, the brushes are great and it is still way better value to buy them in a pack, rather than as a single. Let's go through each of the brushes. I already have this brush from the Travel Essentials Set ($45) and have used it for ages. It really lives up to its name! I use it mostly for powdering and blending but it also makes for a great foundation, blush and bronzer brush. In a pinch, you could apply basically all your face makeup with this one brush as long as you clean it between. This is an amazing staple brush that honestly everyone should have so it was a great inclusion for the pack. This is one of the pack exclusive brushes. I usually prefer a flat top buffing brush for my foundation or something like the Real Techniques Expert Face Brush or Buffing Brush. However, this traditional style foundation brush has really dense and short bristles which is perfect for creating a full coverage look. It really applies the foundation evenly and with high coverage. The only downside is the slightly streaky finish which I find happens with every flat foundation brush that can be perfectly blended out with a sponge like the Real Techniques Miracle Complexion Sponge or Beauty Blender. If you really like a full coverage foundation though, this is definitely a good option. This is definitely my favourite of the pack! I have been struggling to find the perfect highlighter brush. Every one I try is either too small, too big or the wrong density. I sound like Goldilocks! This is a really well thought out brush with an angled bottom which makes applying and blending highlighter on the cheekbones, brow bone, nose and cupid's bow so easy. It has definitely filled a gap in my sisable brush collection and established itself as one of my favourite brushes that I have been using every single day. As long as you know you will get use out of the other brushes too, this is the brush I would buy the pack for. I was actually really impressed by this brush. It is just big enough to apply all over colour but precise enough to lay down shading in the crease and outer v. It also has a slightly flared fluffy end which allows you to blend quite nicely with it too. It is much smaller than the flat shader and fluffy blending brushes I usually use but I was able to do a full eye look (all over colour, blended crease shade and outer-v definition) all with this one brush and it looked basically as good as if I had used my tried and tested Sigma brushes. If you already have this brush from the Starter Set it is one of those eye brushes you could always use a double up of too. I'll be honest, for applying gel liner I didn't actually like this one too much. It just didn't measure up to my Sigma E05 but it still got the job done. That said though, it is absolutely fantastic for precision spot concealing which I do very often. The fine tip allowed me to apply my Laura Mercier Secret Camouflage only to the tiny spots I needed it (à la Lisa Eldridge) which keeps my whole makeup looking more light and fresh. Considering the excellent Angled Highlighter exclusive brush and the versatile options you get in this pack I do think it is worth the money at $15.99 per brush, I just only wished they left out the clutch and made it slightly cheaper that way. It is also worth nothing that Priceline is forever having 25% off sales for Real Techniques so you can always pick it up a lot cheaper. I really do love Real Techniques brushes and I think they are the best you can buy at an affordable price. These definitely stacked up against the great quality we have all come to expect from the brand so I think you will get a lot of use out of this pack if you pick it up. 2 comments on "Real Techniques Deluxe Gift Set"
Great review Emma! I got this set too, and hands down my favourite brush from the set is the angled highlighter brush - I've been using it non-stop! Totally agree about the clutch, I will probably end up throwing it away.